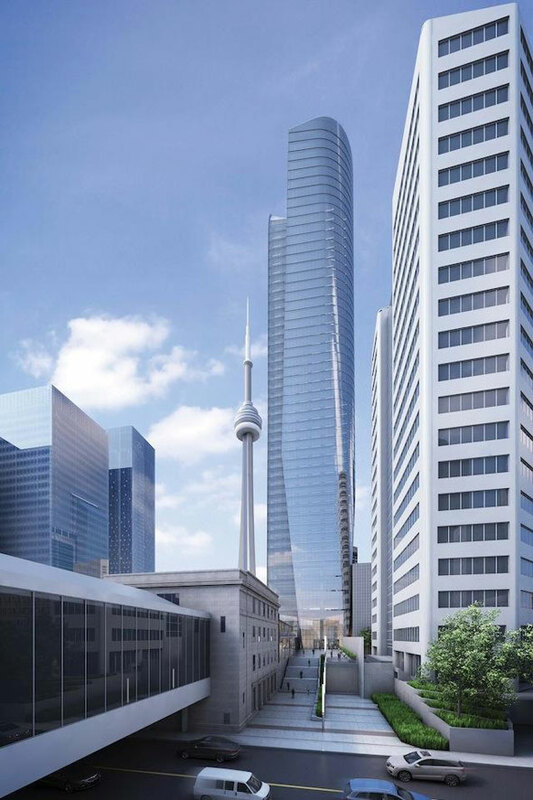 The famous SkyWalk linking Union Station with the CN Tower and Rogers Centre could be partially knocked down and replaced with a new structure, if development plans recommended in a new city report get the green light. Under plans that first surfaced last year, the west end of Station Street would be closed for a new 48-storey office tower and the remainder of the street turned into a pedestrian plaza. Construction would also require alterations to several heritage buildings, including the limestone building at 20 York Street and a low brick wall along the south side of the street that used to be part of a CN Express horse shed. The portion of the SkyWalk along Station Street would lose its distinctive barrel vaulted roof for a more "environmentally appropriate" enclosure, the report says. The latest designs incorporate the portion closest to Simcoe Street into the building's lobby. The interior of the SkyWalk is undergoing extensive renovations to make room for the new Union-Pearson Express rail station, which is due to be completed next year. It's hoped the new Station Street pedestrian plaza will improve conditions for pedestrians exiting the new station and entering the city. The SkyWalk was built in 1989 as a way to provide a direct pedestrian link between Union Station and the SkyDome, thereby reducing the need for parking at the stadium. It's not clear how long the proposed renovations will take to complete. The report will be considered by Toronto Preservation Board on July 17. Image: stevejonesphotos/blogTO Flickr pool, Allied Properties REIT.